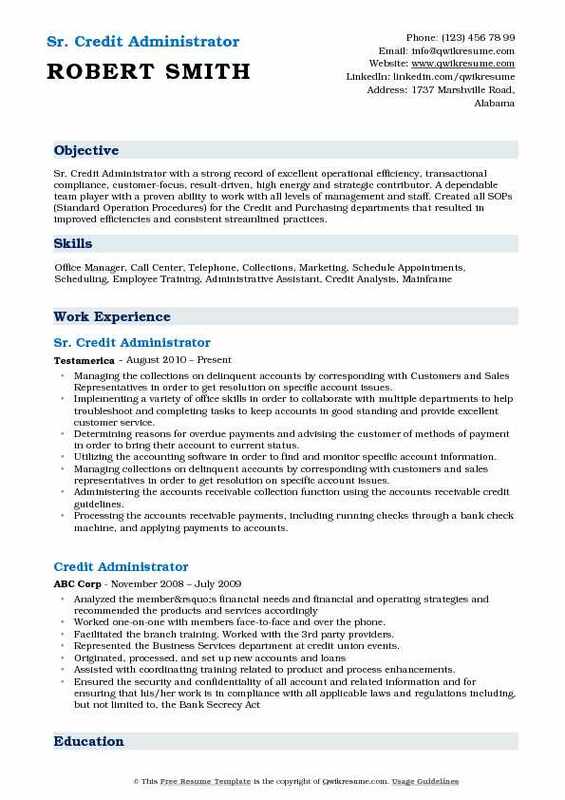 Credit Administrator manages and administers all matters pertaining to Credit transactions and duties. 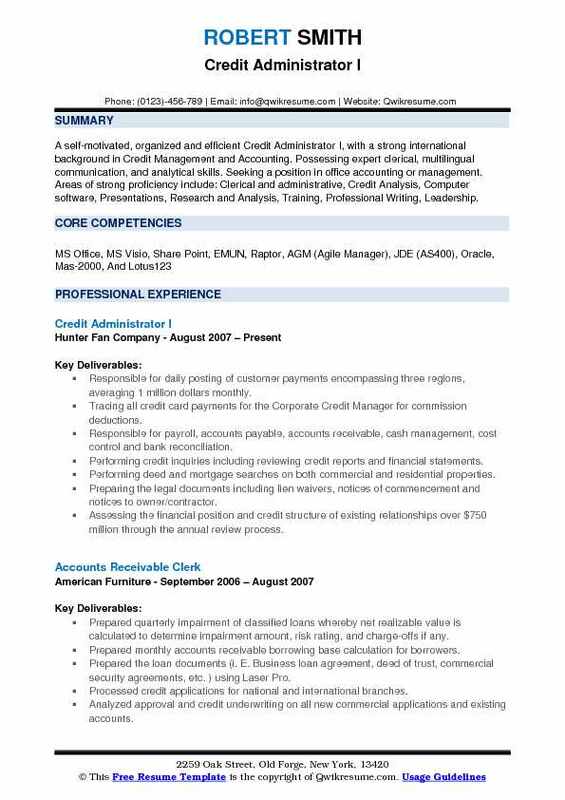 A Well-drafted Credit Administrator Resume emphasizes the following tasks and duties – facilitating and providing electronic solutions for various credit transactions, analyzing the credit requirement of the client, processing approved applications, renewing credit limits for partners and clients, formulating new ways to deal with credit admin process, assessing credit risk, aggregating and evaluating credit-related data, ensuring that the approved credit account is in good standing and establishing term period for credit requests. 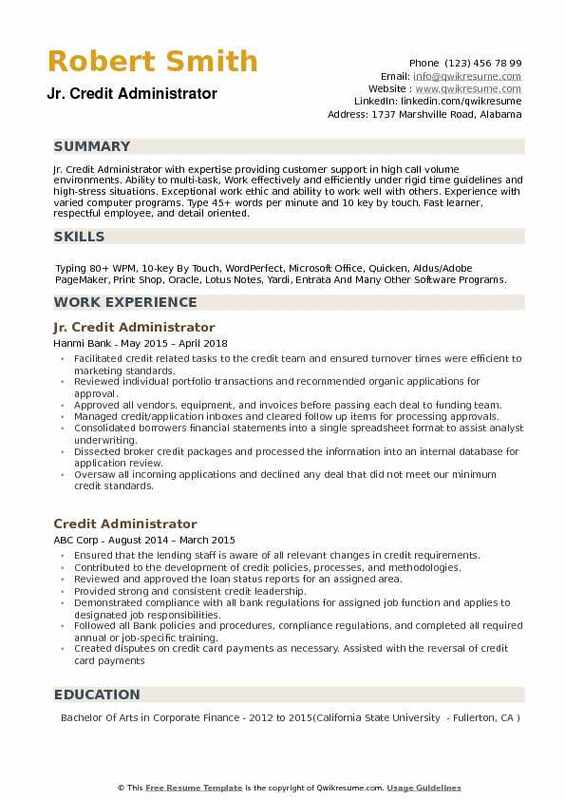 Successful resumes for the post of Credit Administrator demonstrates various skill sets such as – knowledge of credit processes and credit transactions, confidentiality, integrity, strong math skills, computer competencies, judgment, and critical thinking abilities. 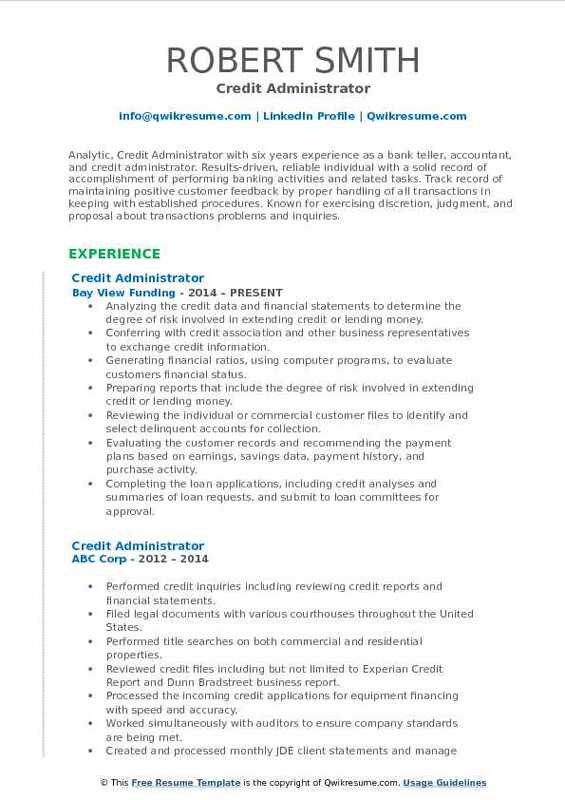 Credit Administrators are required to pass a relevant background check and have a college degree in fields such as finance, economics, accounting or business. 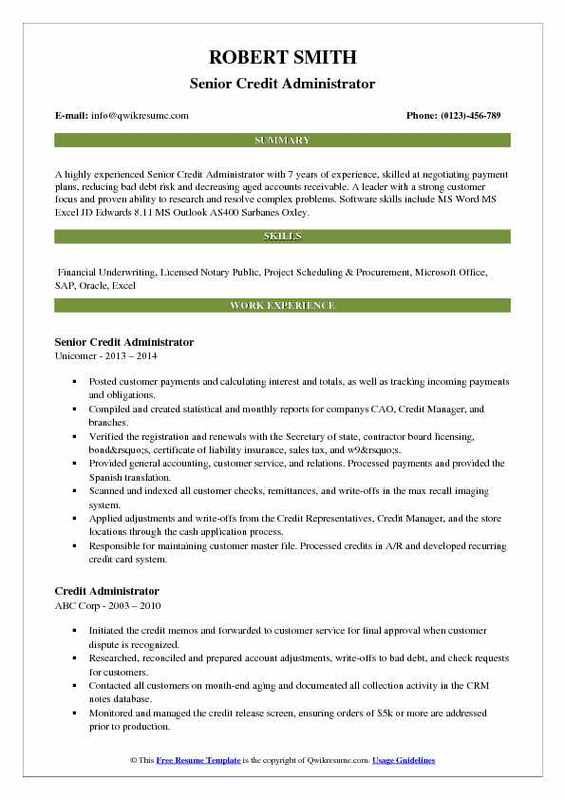 Headline : Result-oriented Credit Administrator with solid experience and demonstrated accomplishments in mortgage lending, and credit analysis. With nearly six years of experience in the mortgage banking/financial industry, Sylvie has a proven track record of efficiency and productivity. Her strong work ethic and exceptional customer service skills, coupled with her demonstrated organizational, interpersonal and communication skills have allowed her to strive in a very challenging environment. Interpreted and analyzed the information obtained from property reports or title reports verifying lien and lien positions. Interpreted and analyzed the broker price appraisals to review values and determining the validity of data. Routinely reviewed the credit reports to include, past due histories, and mortgage debt, as well as, reviewed data on closing costs and unnecessary expenses on short sales. Interpreted the financial statements and tax returns for income verification purposes. Verified that foreclosure process was done correctly and followed legal guidelines and identified the foreclosure and servicing errors. Assured the re-keying process of vacant properties is done following the legal guidelines. Obtained additional information from servicers concerning foreclosure reo process and possible errors as well as for reo in possession. Reviewed internal delinquency reports and forward to mortgage servicers requesting loan level account statuses. Summary : A self-motivated, organized and efficient Credit Administrator I, with a strong international background in Credit Management and Accounting. Possessing expert clerical, multilingual communication, and analytical skills. Seeking a position in office accounting or management. Areas of strong proficiency include: Clerical and administrative, Credit Analysis, Computer software, Presentations, Research and Analysis, Training, Professional Writing, Leadership. Responsible for daily posting of customer payments encompassing three regions, averaging 1 million dollars monthly. Tracing all credit card payments for the Corporate Credit Manager for commission deductions. Responsible for payroll, accounts payable, accounts receivable, cash management, cost control and bank reconciliation. Performing credit inquiries including reviewing credit reports and financial statements. Performing deed and mortgage searches on both commercial and residential properties. Preparing the legal documents including lien waivers, notices of commencement and notices to owner/contractor. Assessing the financial position and credit structure of existing relationships over $750 million through the annual review process. Monitoring covenant/reporting requirements as outlined in the business loan agreement. Preparing the credit memos to recommend risk grade upgrade/downgrade. Summary : A highly experienced Senior Credit Administrator with 7 years of experience, skilled at negotiating payment plans, reducing bad debt risk and decreasing aged accounts receivable. A leader with a strong customer focus and proven ability to research and resolve complex problems. Software skills include MS Word MS Excel JD Edwards 8.11 MS Outlook AS400 Sarbanes Oxley. Posted customer payments and calculating interest and totals, as well as tracking incoming payments and obligations. Compiled and created statistical and monthly reports for company's CAO, Credit Manager, and branches. Verified the registration and renewals with the Secretary of state, contractor board licensing, bond’s, certificate of liability insurance, sales tax, and w9’s. Provided general accounting, customer service, and relations. Processed payments and provided the Spanish translation. Scanned and indexed all customer checks, remittances, and write-offs in the max recall imaging system. Applied adjustments and write-offs from the Credit Representatives, Credit Manager, and the store locations through the cash application process. Responsible for maintaining customer master file. Processed credits in A/R and developed recurring credit card system. Worked with customers on credit and/or credit card issues. 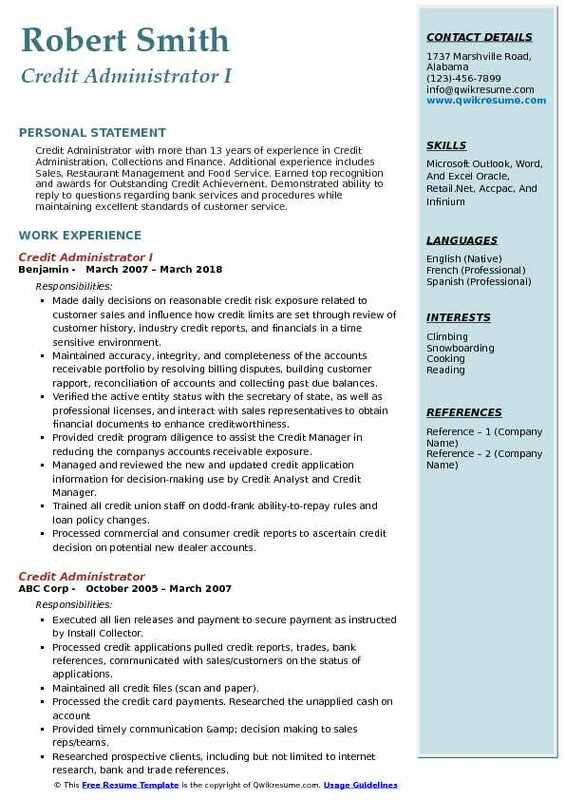 Headline : Analytic, Credit Administrator with six years experience as a bank teller, accountant, and credit administrator. Results-driven, reliable individual with a solid record of accomplishment of performing banking activities and related tasks. Track record of maintaining positive customer feedback by proper handling of all transactions in keeping with established procedures. Known for exercising discretion, judgment, and proposal about transactions problems and inquiries. Analyzing the credit data and financial statements to determine the degree of risk involved in extending credit or lending money. Conferring with credit association and other business representatives to exchange credit information. Generating financial ratios, using computer programs, to evaluate customers financial status. Preparing reports that include the degree of risk involved in extending credit or lending money. Reviewing the individual or commercial customer files to identify and select delinquent accounts for collection. Evaluating the customer records and recommending the payment plans based on earnings, savings data, payment history, and purchase activity. Completing the loan applications, including credit analyses and summaries of loan requests, and submit to loan committees for approval. Preparing final letters and documents including agreements to customers to be notarized and process for funding. 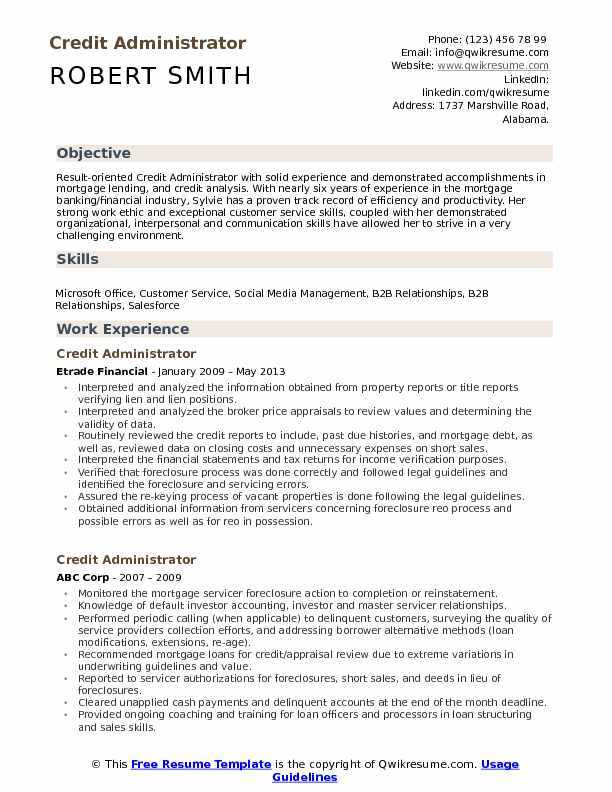 Summary : Credit Administrator with more than 13 years of experience in Credit Administration, Collections and Finance. Additional experience includes Sales, Restaurant Management and Food Service. Earned top recognition and awards for Outstanding Credit Achievement. Demonstrated ability to reply to questions regarding bank services and procedures while maintaining excellent standards of customer service. Made daily decisions on reasonable credit risk exposure related to customer sales and influence how credit limits are set through review of customer history, industry credit reports, and financials in a time sensitive environment. Maintained accuracy, integrity, and completeness of the accounts receivable portfolio by resolving billing disputes, building customer rapport, reconciliation of accounts and collecting past due balances. Verified the active entity status with the secretary of state, as well as professional licenses, and interact with sales representatives to obtain financial documents to enhance creditworthiness. Provided credit program diligence to assist the Credit Manager in reducing the company's accounts receivable exposure. Managed and reviewed the new and updated credit application information for decision-making use by Credit Analyst and Credit Manager. Trained all credit union staff on dodd-frank ability-to-repay rules and loan policy changes. Processed commercial and consumer credit reports to ascertain credit decision on potential new dealer accounts. Summary : Sr. Credit Administrator with a strong record of excellent operational efficiency, transactional compliance, customer-focus, result-driven, high energy and strategic contributor. A dependable team player with a proven ability to work with all levels of management and staff. Created all SOPs (Standard Operation Procedures) for the Credit and Purchasing departments that resulted in improved efficiencies and consistent streamlined practices. Managing the collections on delinquent accounts by corresponding with Customers and Sales Representatives in order to get resolution on specific account issues. Implementing a variety of office skills in order to collaborate with multiple departments to help troubleshoot and completing tasks to keep accounts in good standing and provide excellent customer service. Determining reasons for overdue payments and advising the customer of methods of payment in order to bring their account to current status. Utilizing the accounting software in order to find and monitor specific account information. Managing collections on delinquent accounts by corresponding with customers and sales representatives in order to get resolution on specific account issues. Administering the accounts receivable collection function using the accounts receivable credit guidelines. Processing the accounts receivable payments, including running checks through a bank check machine, and applying payments to accounts. Skills : Oracle, SAP (System Application and Products) AS400, Quick Books, Microsoft Excel, Word, and PowerPoint. Ensured process completion of bad debt accounts for write off, created a spreadsheet for cash application of collection agency payments. Verified direct payments and product returns of bad debt account prior to submission of check request for payment of collection agency fees. Received and processed returned bank checks. Entered rebill invoices. Verified and filed checks to telecheck for recovery of monies. Setup account subscriptions and process credit card payments within CyberSource. Entered the adjustment batches for the application of credit memos to invoices, applying for unapplied payments and reapplying misapplied payments. Processed and procedures, daily monitoring, and timely trade coordination throughout the relationship. Reviewed credit agreement for pertinent information regarding assignment fees, interest. 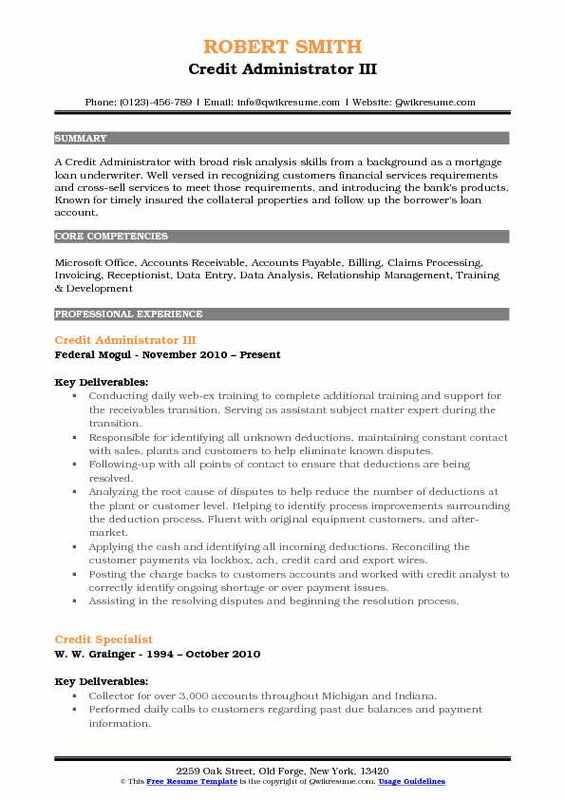 Summary : A Credit Administrator with broad risk analysis skills from a background as a mortgage loan underwriter. Well versed in recognizing customers financial services requirements and cross-sell services to meet those requirements. and introducing the bank's products. Known for timely insured the collateral properties and follow up the borrower's loan account. Conducting daily web-ex training to complete additional training and support for the receivables transition. Serving as assistant subject matter expert during the transition. Responsible for identifying all unknown deductions, maintaining constant contact with sales, plants and customers to help eliminate known disputes. Following-up with all points of contact to ensure that deductions are being resolved. Analyzing the root cause of disputes to help reduce the number of deductions at the plant or customer level. Helping to identify process improvements surrounding the deduction process. Fluent with original equipment customers, and after-market. Applying the cash and identifying all incoming deductions. Reconciling the customer payments via lockbox, ach, credit card and export wires. Posting the charge backs to customers accounts and worked with credit analyst to correctly identify ongoing shortage or over payment issues. Assisting in the resolving disputes and beginning the resolution process. Summary : An experienced Credit Administrator with 13 years of consumer interactive service. Ability to work as part of a team, or independently, as required. Skilled at inventory and currency audits, financial data entry, loan verification and processing. Computer literate, accom- panied with excellent communication and organizational skills, which have been utilized in socially diverse environments. Skills : Microsoft Word, Excel, Outlook, Kronos Timekeeping, Typing 50 Wpm, 10 Key, Data Entry. Managed loan portfolio for ultra-high net worth clients. Booked, processed and maintained clients credit facilities, loans, and letters of credit. Provided support to diverse group of product providers (investment finance, client associates, bankers). Reviewed terms and conditions of loan documents prior to booking facility. Identified and monitored deficiencies. Conducted daily quality control reviews to ensure the accuracy of the product processor. Prepared general ledger debit/credit tickets associated with sub-ledger entries. Examined end-to-end operational procedures to develop a strategy to revolutionize existing practices. Sustained strong controls over operational practices to mitigate potential business risk. Worked to nurture positive customer relationships while protecting corporate revenue and minimizing the potential for future toxic credit. 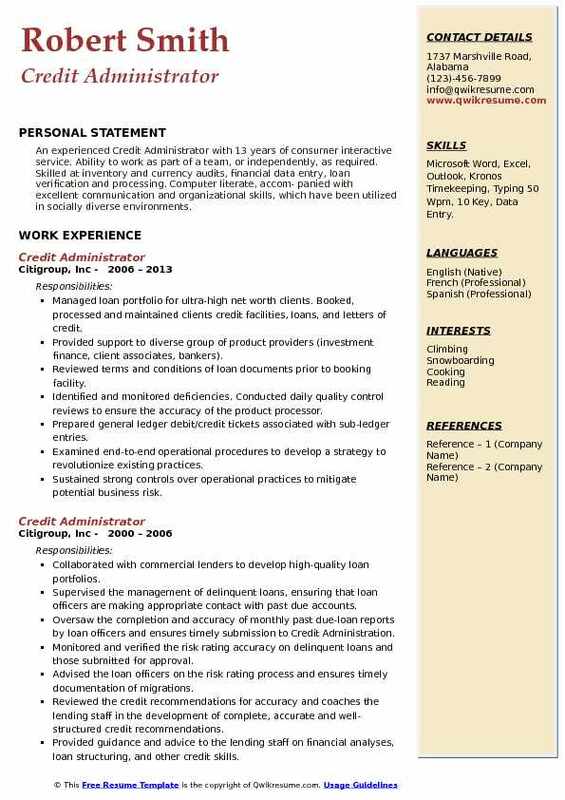 Objective : Jr. Credit Administrator with expertise providing customer support in high call volume environments. Ability to multi-task, Work effectively and efficiently under rigid time guidelines and high-stress situations. Exceptional work ethic and ability to work well with others. Experience with varied computer programs. Type 45+ words per minute and 10 key by touch. Fast learner, respectful employee, and detail oriented. Skills : Typing 80+ WPM, 10-key By Touch, WordPerfect, Microsoft Office, Quicken, Aldus/Adobe PageMaker, Print Shop, Oracle, Lotus Notes, Yardi, Entrata And Many Other Software Programs. Facilitated credit related tasks to the credit team and ensured turnover times were efficient to marketing standards. Reviewed individual portfolio transactions and recommended organic applications for approval. Approved all vendors, equipment, and invoices before passing each deal to funding team. Managed credit/application inboxes and cleared follow up items for processing approvals. Consolidated borrowers financial statements into a single spreadsheet format to assist analyst underwriting. Dissected broker credit packages and processed the information into an internal database for application review. 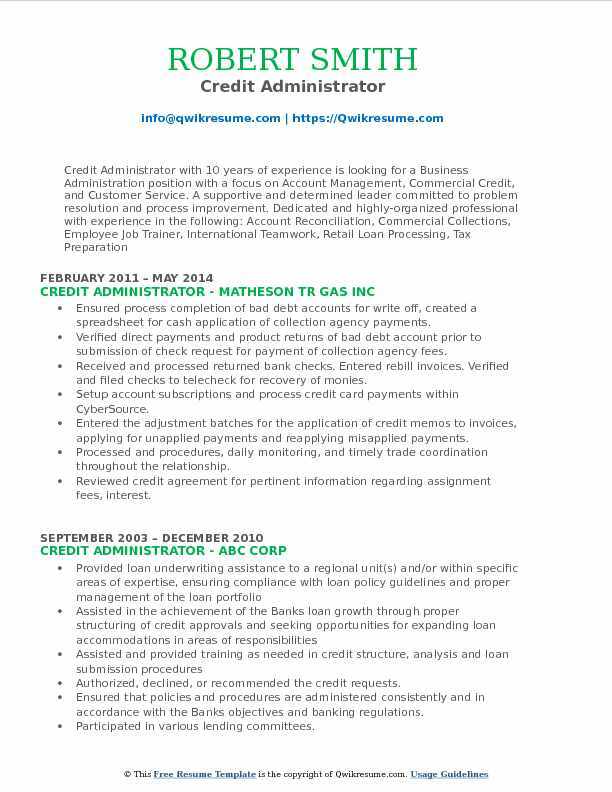 Oversaw all incoming applications and declined any deal that did not meet our minimum credit standards. Maintained a log of new accounts and ran reports to ensure that company goals were met. Evaluated commercial residential customer risk to ensure credit policies are enforced and revenue is collected. Monitored collection and refund activity for commercial and residential customers.